If you still have some spare growing space in your garden, May is the perfect time to grow a runner bean wigwam. It makes an exciting space for imaginative play and is also cool and shady. If you fancy giving it a go, take 8 garden canes, each around 2 m long and put into the ground in a semi circle. Adjust the position of the canes to allow for a play space inside and a gap for the doorway. Angle the canes inwards, and tie securly to form a tepee shape. Take some runner bean or sweet pea plants and sow two or three next to each cane. Water regularly, and as the plants grow gently train them around the canes. One tepee is big enough for two children to play in, so if you have the space and lots of children why not grow several. 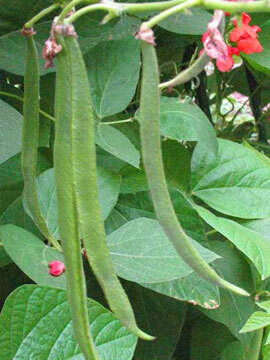 And as the summer progresses the play den will produce lots of lovely flowers or beans as the plants grow! We are delighted to announce the latest winner of our schools competition that ended recently. We asked schools to design and implement a project that improved the environment at their school. We received so many excellent entries and it was a tricky job to choose the best. But after lots of careful thought we chose the entry from Thornleigh Salesian College as our winner. Thornleigh Salesian College organised a Big Tidy Up and Bulb Planting Day at the end of January. They then made posters to advertise the event to everyone they could think of – students, teachers, families and neighbours. The day began bright and sunny and over 40 volunteers turned up to help out. The group made great improvements to the school grounds and planted around 1000 bulbs. We particularly liked this project because it had a real community feel and was a great example of the power of teamwork. The school managed to get sponsorship from Action Earth, the bulbs were donated by a local company, tools were loaned from the Local Council, and lots of volunteers were found from within the community around the college – A Fantastic Effort! The school has won £250 worth of wildlife products from Recycleworks Ltd, and will be choosing what they would like over the next few days. Because of the high standard of the entries we also decided to award runner up prizes to four other schools. These were Redstart School in Somerset, St Andrew’s C.E. Primary School in Manchester, Shaping Futures Day Nursery in Nottingham and Ysgol babanod Llangennech Infant School, Carmarthenshire. If you missed out on our last round of competitions, the good news is we are now running a new Family Zone Competition and School Zone Competition. Both end on 31st July and we are offering some fabulous gardening and wildlife prizes from the Recycleworks Ltd . Do take a look and why not have a go – you could be a winner!! Having been involved with the Country Trust for over 25 years in the role of a ‘host’, I thought I would put a post on the blog to promote their work and to bring them to the attention of teachers in urban schools who, along with their pupils have become disconnected from the natural world and unaware of where their food comes from or how it is produced. As teaching outside ‘the classroom’ has declined, it is important to increase the flow of schoolchildren into the countryside to learn about farming, food, environment, history, geography and science. The Country Trust’s scheme is simple, cost-effective and unique. They arrange for schools selected by the Trust from the disadvantaged inner city areas to visit hosts chosen by the Trust for their ability to offer children a stimulating glimpse of life in the countryside. The hosts make no charge for these visits, the Trust organises the visits and helps the schools with the cost of transport and accommodation. The children and their teachers get the chance to spend a day in the countryside, visiting either farms or other places on interest – which for example, might for example have interesting wildlife for them to see. It ends up as a day they remember for a very long time – the thank you letters we receive from the pupils make the time and effort all worthwhile. For many of the children (and their teachers), these visits can be the first time they have ever been on to a working farm and are often real eye openers, such as seeing a cow been milked. We want our children to ‘Love their Environment’, however if they don’t fully appreciate it, they never will and this is why The Country Trust plays a very important role. If you are a teacher or have children at an inner city school or in a socially deprived area, please visit the Trust’s Website where you can find out more about what the Trust does, how to contact them and more importantly read some of the comments made by teachers, pupils and hosts.